Make sure to charge your rear bike lights! The outdoor road riding season starts on May 4th! VQ Chicago Swims & Strength Training are back to the regular schedule this week. 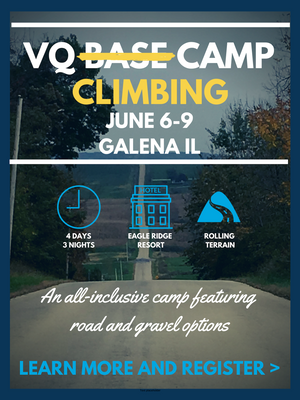 VQ Madison Rides are Now Open for Registration: June 29th & July 27th! Whether you are doing IM Wisconsin or if you are looking for a long challenging ride, come join us on the rolling terrain of the Ironman Wisconsin bike course! This ride is for everyone, from the novice to the Kona qualifier. Sign up and Get More info on our Madison Rides. Dare2tri is ready to kick off the season with a giant Chicago-style street festival and celebration - and you're invited to Start the Season! The event is a family-friendly fundraiser that helps Dare2tri provide opportunities for athletes with physical disabilities and visual impairments by covering the costs of camps, equipment, and transportation. For more details and registration visit here! Your best training days start the night before, with good sleep! The Oura ring is a sleep and activity tracker designed to help you monitor your rest and recovery so that you can perform better than you even imagined. VQers can now get $58 off of an Oura Ring using this link. TrekHP Ladies Night | Thursday May 2: Sunshine and warm weather are on the way! Join the ladies of TrekHP for a fun women's night event to kick off the season with informational presentations, raffles, shopping discounts, refreshments, and a great opportunity to meet other women who ride. Sign up here! Check out the third edition of the Swim Drill of the Week at the bottom of the page and then hop in the pool this week to put it to work! Outdoor Rides on the Road Start May 4th - stay tuned for more updates!